large bunch fresh spinach, large stems removed. Step 1: Sauce. Heat 2 Tbls olive oil in large fry pan, add garlic and stir to flavor oil. Stir in zucchini, red pepper, and onion. Cook about 8 minutes, or until veggies start to brown. Add tomatoes and cook about 10 minutes more, turning down heat to simmer. Remove from heat and pulse through food processor until “spreadable” but veggies are still a bit chunky. Step 2: Cheese. Combine ricotta, eggs, basil, garlic powder, and salt and pepper. Beat until fluffy. Set aside. Step 3: Lightly spray lasagna pan. Put about a cup of sauce in the bottom, spread around. Step 4: Put first 3 noodles on bottom layer; they will expand and should not quite touch. Next put a generous “sploop” of cheese mixture on each noodle and spread to cover. Layer 1/2 your spinach on top. Pour 1/3 remaining sauce over this, then 1/3 your mozzarella. Step 6: Put remaining layer of noodles on top. Pour remaining sauce over all, then sprinkle with remaining mozzarella and Parmesan. Cover with foil. Bake at 350 degrees for 50-60 minutes. We served this with salad and rosemary bread. Yum. Craig said we could make it again — high praise, from this carnivore! Photo Credit: We borrowed this one. 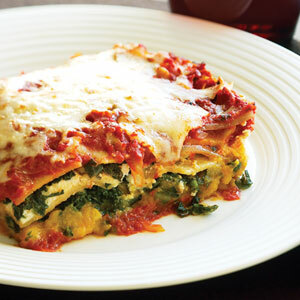 This entry was posted in recipes and tagged easy lasagna, meatless recipes, vegetable lasagna by heidihesssaxton. Bookmark the permalink.